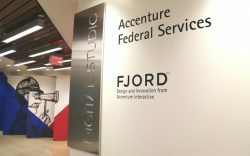 Accenture–already recognized as a highly-modern, hi-tech company on the rise–is working to redefine how the federal government community uses new digital technologies (i.e. cloud, analytics, cyber, artificial intelligence). In an exclusive interview with John Goodman, the newly-appointed chief executive officer of Accenture Federal Services, ExecutiveBiz got him to open about the company’s vision, foresight for the future, and exactly how Accenture is raising the bar. EM: We’re here with John Goodman, the new chief executive officer of Accenture Federal Services (AFS). Congratulations on the new appointment. You’ve had a long tenured, successful career. Tell us about you what’s brought you to this point. John Goodman: Over the last 20 years at Accenture, I’ve had a variety of roles including leading both our Defense portfolio and our global public service management consulting practice. For the last five years, I’ve served as Chief Operating Officer of Accenture Federal Services. Before joining Accenture, I worked for the Department of Defense (DoD) developing policies on industrial base issues. Eventually, I took on the responsibility of guiding policies for military installations around the world. During this time, we had the incredible opportunity to help the DoD privatize military family housing and take it through a revitalization process. We were able to accomplish the improvements in a much shorter time-frame than we previously thought possible. The program had strong support from military leadership and bipartisan support in Congress. I learned just how much can be done to improve how government works, especially when working together with the private sector. I also learned that while getting the policy right is important, preparing an organization to execute, implement and achieve its objectives is really where the rubber meets the road. That’s what brought me to Accenture; we’re a company that helps our clients develop innovative solutions and deliver meaningful outcomes. I’m absolutely thrilled to lead Accenture Federal Services. I love it and it’s a good home for me. What does 2018 look like in terms of priorities and strategies? We’re a disruptive player in the market. We’re focused on bringing innovative solutions powered by new technologies that deliver value now to our clients. We bring great strengths in everything from analytics to cloud to agile capability. At the same time, we are rethinking processes and delivering value to our clients and their customers through creative operating models. For instance, we’re delivering outcomes and as-a-service capabilities on a transaction basis as opposed to just simply consulting. AFS is eager to sign up for work where we can be measured based on the outcomes we deliver, not the hours we work. We have a strong, collaborative culture, and we are confident about our ability to deliver. I think our capabilities and our orientation give us an advantage in the market. We built momentum here in 2017 and we’re focused on bringing this approach to even more clients in 2018. I’ve been spending a lot of time with clients and there’s real enthusiasm for it. A recent example of this is the contract Accenture was awarded by the Transportation Security Administration (TSA). We support the TSA Office of Human Capital in recruiting and hiring 8,000 – 10,000 personnel each year. This involves hiring employees for critical field positions, including transportation security officers, federal air marshals and field management administrative and professional positions. We’re bringing Accenture’s global leadership in human resource operations and federal HR expertise to help TSA hire its workforce of the future. What are some of the technologies and challenges you see in the federal market? First, our cloud capabilities; second, analytics; third, cyber; fourth artificial intelligence. We are particularly excited about the change in the market as it relates to cyber. Last year, we acquired Defense Point Security, which is a leader in security operations. We also acquired the federal services arm of Endgame, which specializes in proactive cyber defense capabilities and vulnerability assessments. These acquisitions enable us to broaden the range of services we offer–from strategy to securing applications within the infrastructure. For smaller agencies, we can deliver very similar assets through our security operations centers and provide as-a-service capabilities to our clients. Let’s talk about digital. How do you think the federal government can harness digital to accomplish their missions? Last year, we opened a Digital Studio in Washington, D.C., to serve our clients. Our focus is two-fold: first we want to bring our clients into a studio space where we can jointly explore how to solve problems from a human-centric perspective. Second, we want to help them create digital experiences for citizens that mirror user experiences in the private sector. Digital makes that experience better and the overall process more efficient; it also leads to better results. The take-up has been incredible. We’ve had dozens and dozens of senior agency leaders and their teams spend time with us in the studio. It’s a refreshing approach for them. It enables our clients to rethink how they’re providing a service and implement new ways to make it better. The challenges that clients bring into the Studio are big issues they are tackling, but where they may not have their hands around the solution just yet. This gives our clients the opportunity to think through their problem with a different mindset. What are some of the major technology trends that you are watching in the federal market? We are investing in the future, especially in artificial intelligence (AI). We believe that AI has the capacity to help make the government more responsive, more efficient, and more effective. AI will improve how government agencies respond to citizens, process claims, and analyze data to solve problems—that’s just a few of the opportunities we’re exploring. It’s an exciting time to be working for the government. There’s increased interest in doing things differently; for instance, buying as-a-service (XaaS) capabilities. Recently, Accenture introduced the FedRAMP-certified Accenture Insights Platform for Government (AIP), which clearly demonstrates the benefits of as-a-service platforms. AIP is a preconfigured stack of tools that enables clients to stand up an analytics platform and address their problems quickly. Under the old model, clients would need to acquire software licenses, stand up a team, and purchase hardware–which meant solving the problem would be a multi-year process. With a preconfigured platform, the client can buy it only when they need it, stand up their capability quickly, and use their data to solve a problem in a much shorter time frame, without all the extraneous costs. It’s a case of combining digital capabilities with a new business model to help clients get to outcomes much faster. Prior to coming to Accenture, Goodman served for five years in the federal government. As the Deputy Under Secretary of Defense (Industrial Affairs & Installations), he led the development and implementation of the Department of Defense’s successful military housing privatization initiative, worked with local communities to enable the productive reuse of closing military bases, and guided the analysis of industrial base issues—including defense mergers and acquisitions. 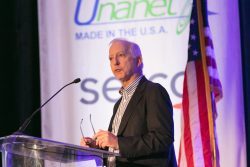 He also served as Deputy Assistant Secretary of Defense for Industrial Affairs as well as on the staff of the National Economic Council, the White House office responsible for coordination of economic policy. He was an associate professor at the Harvard Business School, and is a published author. 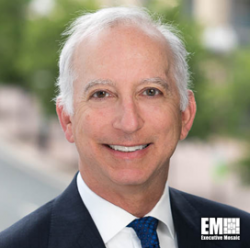 Goodman is chair of the board of Accenture Federal Services; member (and former chair) of the Executive Committee of the Professional Services Council; member of AFCEA’s executive committee, and a member of the Council on Foreign Relations. He is a former chairman of the Defense Business Board. Goodman was a Fed100 Award winner in 2015 and has been awarded the Office of the Secretary of Defense Medal for Exceptional Public Service, the Department of Defense Medal for Distinguished Public Service, and the Department of Defense Medal for Outstanding Public Service.